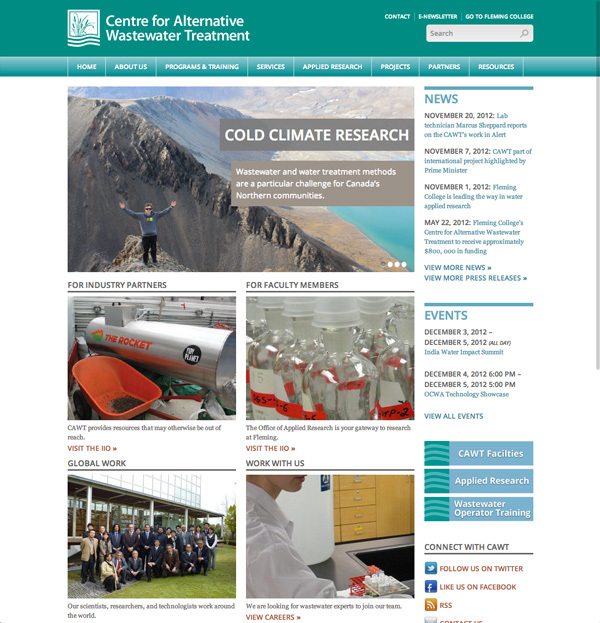 Last year I was hired by Actual Media to design and develop a new website for the Centre for Alternative Wastewater Treatment. The CAWT, which is a part of Fleming College, is a centre for research and education in water and wastewater treatment science. I worked with Actual Media to design and build a WordPress website that’s aesthetically pleasing, easy to navigate, and, maybe just as importantly, very easy to maintain and update. The design process involved creating a set of wireframes, establishing the feel of the site through a series of moodboards, and creating full comps before moving into development. In order to make the website as easy to update as possible, I customized the WordPress backend to make just about everything easily editable through custom meta boxes and fields, custom post types, editable navigation menus, and custom widgets.